Oh the joy of going on a Sunday afternoon picnic when we were children. It's hard to believe that we are all dressed in our Sunday best for a picnic in the park by the lake. True, it was a Sunday afternoon, but it was the norm in those days... my mom in her pretty dress and my dad in his suit and tie. If it got warm on a summer's day, then off would come the jacket and maybe his shirt sleeves would be rolled up. That's Little Sis in blue and me in pink ... with our blonde, blonde hair ... posing on the front seat. The young fellow behind us is our older cousin, and maybe we were both just a little bit in love with him. He was so handsome. Having no defined recollection of this particular picture, I'm not sure what we ate that day, maybe it was fried chicken and potato salad. Or, sandwiches with ham or sliced meat with pimento cheese -- I see the loaf of bread. I loved those simpler times when our outings often included a leisurely drive down interesting, meandering country roads. Up hills and then the z-o-o-m down the other side, often on dirt or gravel roads where tiny rocks would pong and ping off the car sides and bottom, a whirl of dust in our wake. Sometimes we'd stop for a visit at our newly married aunt and uncle's place. Sometimes we'd stop at a neighbours -- that's when we hoped the family would have kids our age to play with. Other times when the car faced west towards the nearby lake and summer village, that's when we knew ice cream or even spun sugar cones would be the treat at the end of the journey. Oh joy, oh bliss! My, that's a long time ago. I'm so glad for family photos as they remind us of those happy moments we've nearly forgotten. 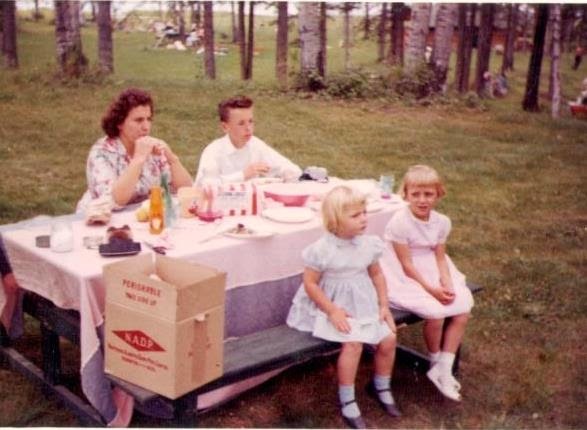 Brenda, those family picnics were so much fun. Someone mentioned being worried about foods spoiling the other day, and it made me think of those family reunions where the food sat out all afternoon while folks nibbled....and I don't think any one got sick from it. Oh Brenda, you just took me back to my childhood! Thank-you for the nostalgia. Picnics are still one of my all-time favorite things to do! 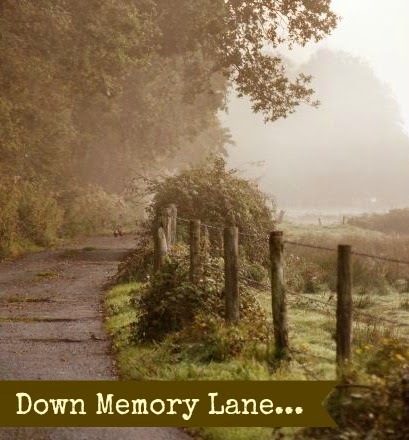 Your memories evoke my own memories! Thank you for that. This reminds me of Sunday afternoon drives with my family. We often ended at Dairy Queen for an ice cream cone. Gas prices were more conducive to driving just for something to do back in the day. Yes, I remember when "dressing up" was the norm! There are oodles of pictures of me and my younger sister wearing matching dresses. or, like you and your sister, wearing similar styles in different colors. I distinctly remember us both having gingham skirts with attached suspenders, Linda's in blue, mine in pink. And my mom always wore beautiful dresses. what a fun family tradition and memories! What a great picture to bring back memories! I think we all can find something in this picture to "throw back" to. Love the photo. Sweet memories of simpler times indeed. I had those short bangs too!